When our community faces disaster, United Way of Greater Houston plays a key role in helping our neighbors and our region recover and rebuild. 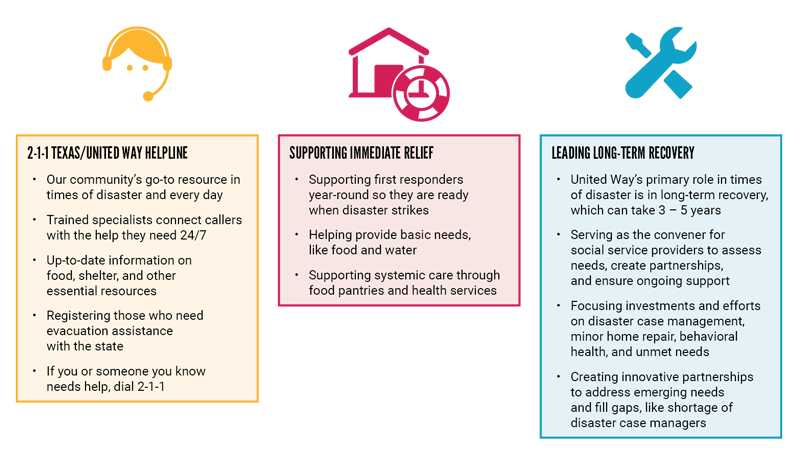 From ensuring our first responders can act swiftly to leading our community’s long-term recovery, United Way has the experience, networks, and capacity to address even the most devastating disasters. We launched the United Way Relief Fund to help support our community in the aftermath of Harvey. 100% of every gift to the United Way Relief Fund goes to help our neighbors and our community recover from Hurricane Harvey. We have invested more than $49 million so far to help our neighbors with basic needs assistance, disaster case management, minor home repair, and unmet needs, helping more than 62,000 families. Click here for details on all United Way Relief Fund investments. We've also created the After the Storm resource guide to help you recover from Hurricane Harvey. Download it in English or in Spanish.